Extent of Hoysala Empire, 1200 C.E. The Hoysala Empire (Kannada: ಹೊಯ್ಸಳ ಸಾಮ್ರಾಜ್ಯ) (pronunciation: [hojsəɭə saːmraːdʒjə] (help·info) in Kannada) stood as a prominent South Indian empire that ruled most of the modern day state of Karnataka between the tenth and the fourteenth centuries. The capital of the empire initially resided at Belur, later moving to Halebidu. The Hoysala rulers originally lived as hill peoples of Malnad Karnataka, an elevated region in the Western Ghats range. In the twelfth century, taking advantage of the internecine warfare between the then ruling Western Chalukyas and Kalachuri kingdoms, they annexed areas of present day Karnataka and the fertile areas north of the Kaveri River delta in present day Tamil Nadu. By the thirteenth century, they governed most of present-day Karnataka, parts of Tamil Nadu and parts of western Andhra Pradesh in Deccan India. The Hoysala era emerged as an important period in the development of art, architecture, and religion in South India. The empire is remembered today primarily for its temple architecture. Over a hundred surviving temples exist across Karnataka, including the well known Chennakesava Temple at Belur, the Hoysaleswara Temple at Halebidu, and the Kesava Temple at Somanathapura. The Hoysala rulers also patronized the fine arts. That patronage encouraged literature to flourish in Kannada and Sanskrit. Kannada folklore tells of a young man, Sala, instructed by his Jain guru Sudatta to strike dead a tiger he encountered near the temple of the Goddess Vasantika at Sosevur. The word "strike" literally translates to "hoy" in Hale Kannada (Old Kannada), hence the name "Hoy-sala." That legend first appeared in the Belur inscription of Vishnuvardhana (1117), but owing to several inconsistencies in the Sala story it remains in the realm of folklore. The legend may have come into existence or gained popularity after King Vishnuvardhana's victory over the Cholas at Talakad as the Hoysala emblem depicts the fight between the mythical Sala and a tiger, the emblem of the Cholas. Early inscriptions, dated 1078 and 1090, have implied that the Hoysalas descended from the Yadava by referring to the Yadava vamsa (clan) as Hoysala vamsa. Records have yet to be found directly linking the Hoysalas to the Yadavas of North India. 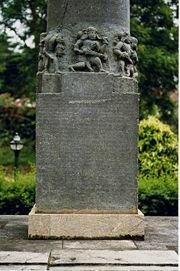 Historians refer to the founders of the dynasty as natives of Malnad Karnataka, based on numerous inscriptions calling them Maleparolganda or "Lord of the Male (hills) chiefs" (Malepas). The Hoysala kings proudly used that title in the Kannada language as their royal signature in their inscriptions. Literary sources from that time in Kannada (Jatakatilaka) and Sanskrit (Gadyakarnamrita) have also helped confirm they had been natives of the region known today as Karnataka. The first Hoysala family record dates to 950, naming Arekalla as the chieftain, followed by Maruga and Nripa Kama I (976). Nripa Kama II, who held such titles as Permanadi that show an early alliance with the Western Ganga dynasty, succeeded the next ruler, Munda (1006–1026). From those modest beginnings, the Hoysala dynasty began its transformation into a strong subordinate of the Western Chalukyas. Through Vishnuvardhana's expansive military conquests, the Hoysalas achieved the status of a real kingdom for the first time. He wrested Gangavadi from the Cholas in 1116 and moved the capital from Belur to Halebidu. Veera Ballala II, the grandson of Vishnuvardhana, fulfilled his ambition of creating an independent empire by freeing the Hoysalas from subordination in 1187. Thus the Hoysalas began as subordinates of the Western Chalukyas and gradually established their own empire in Karnataka with such strong Hoysala kings as Vishnuvardhana, Veera Ballala II and later Veera Ballala III. During that time, peninsular India saw a four way struggle for hegemony - Pandya, Kakatiya and Seuna Yadavas of Devagiri being the other kingdoms. Veera Ballala II defeated the aggressive Pandya when they invaded the Chola kingdom and assumed the title "Establisher of the Chola Kingdom" (Cholarajyapratishtacharya), "Emperor of the south" (Dakshina Chakravarthi) and "Hoysala emperor" (Hoysala Chakravarthi). He founded the city of Bangalore according to Kannada folklore. 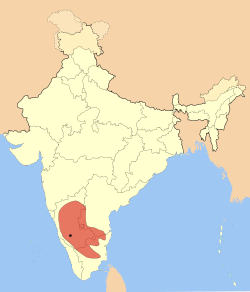 The Hoysalas extended their foothold in areas known today as Tamil Nadu around 1225, making the city of Kannanur Kuppam near Srirangam a provincial capital, giving them control over South Indian politics that began a period of Hoysala hegemony in the Southern deccan. His son Vira Someshwara earned the honorific "uncle" (Mamadi) from the Pandyas and Cholas. The Hoysala influence spread over Pandya kingdom also. Toward the end of 13th century, Veera Ballala III recaptured territory lost to the Pandya uprising and expanded his kingdom to encompass all areas south of the Krishna River. Major political changes took place in the Deccan region in the early 14th century when significant areas of northern India came under Muslim rule. Alla-ud-din Khilji, the Sultan of Delhi, determined to bring isolated South India under his domain, sent his commander, Malik Kafur, on a southern expedition to plunder the Seuna capital Devagiri in 1311. They subjugated the Seuna empire by 1318, sacking the Hoysala capital Halebidu (also called Dorasamudra or Dwarasamudra) twice, in 1311 and 1327. By 1336, the Sultan had conquered the Pandyas of Madurai, the Kakatiyas of Warangal and the tiny kingdom of Kampili. The Hoysalas stood as the only remaining Hindu empire able to resist the invading armies. Veera Ballala III stationed himself at Tiruvannamalai, offering stiff resistance to invasions from the north and the Sultanate of Madurai to the south. Then, after nearly two decades of resistance, Veera Ballala III died at the battle of Madurai in 1343 and the sovereign territories of the Hoysala empire merged with the areas administered by Harihara I in the Tungabhadra region. That new Hindu kingdom resisted the northern invasions, later prospering as the Vijayanagara Empire. The Hoysala administration supported itself through revenues from an agrarian economy. The kings gave grants of land as rewards for service to beneficiaries who then became landlords to tenants producing agricultural goods and forest products. Two types of landlords (gavunda) existed; gavunda of people (praja gavunda) lower in status than the wealthy lord of gavundas (prabhu gavunda). The highlands (malnad regions) with its temperate climate proved suitable for raising cattle and the planting of orchards and spices. Paddy and corn served as staple crops in the tropical plains (Bailnad). The Hoysalas collected taxes on irrigation systems including tanks, reservoirs with sluices, canals and wells built and maintained at the expense of local villagers. The state created irrigation tanks such as Vishnusagara, Shantisagara, Ballalarayasagara at their expense. Importing horses for use as general transportation and in army cavalries of Indian kingdoms became a flourishing business on the western seaboard. Hoysalas harvested the forests for rich woods such as teak, exporting through ports located in the area of present day Kerela. Sung dynasty records from China mention the presence of Indian merchants in ports of South China, indicating active trade with overseas kingdoms. South India exported textiles, spices, medicinal plants, precious stones, pottery, salt made from salt pans, jewels, gold, ivory, rhino horn, ebony, aloe wood, perfumes, sandalwood, camphor and condiments to China, Dhofar, Aden, and Siraf (the entryport to Egypt, Arabia and Persia). Architects (Vishwakarmas), sculptors, quarry workers, goldsmiths and other skilled craftsmen whose trade directly or indirectly related to temple construction also became prosperous due to the vigorous temple building activities. The village assembly assumed responsibity for collecting government land taxes. The government included land revenue, called Siddhaya, in the original assessment (Kula) plus various cesses. Professions, marriages, goods in transit on chariots or carriages, and domesticated animals all had taxes levied on them. Village records note taxes on commodities (gold, precious stones, perfumes, sandalwood, ropes, yarn, housing, hearths, shops, cattle pans, sugarcane presses) as well as produce (black pepper, betel leaves, ghee, paddy, spices, palm leaves, coconuts, sugar). The village assembly could levy a tax for a specific purpose such as construction of a water tank. In its administrative practices, the Hoysala Empire followed some of the well-established and proven methods of its predecessors covering administrative functions such as cabinet organization and command, the structure of local governing bodies and the division of territory. Records show the names of many high ranking positions reporting directly to the king. Senior ministers, called Pancha Pradhanas, ministers responsible for foreign affairs, designated Sandhivigrahi, and the chief treasurer, Mahabhandari or Hiranyabhandari conducted top level government affairs. Dandanayakas led the armies while Dharmadhikari served as the chief justice of the Hoysala court. The kingdom divided into provinces named Nadu, Vishaya, Kampana and Desha, listed in descending order of geographical size. Each province had a local governing body consisting of a minister (Mahapradhana) and a treasurer (Bhandari) that reported to the ruler of that province (Dandanayaka). Under that local ruler, officials called Heggaddes and Gavundas hired and supervised the local farmers and laborers recruited to till the land. Subordinate ruling clans such as Alupas continued to govern their respective territories while following the policies set by the empire. An elite and well trained force of bodyguards known as Garudas protected the members of the royal family at all times. Those servants moved closely yet inconspicuously by the side of their master, their loyalty being so complete that they committed suicide after his death. The government erected Garuda pillars, or Hero stones (virgal) in memory of those bodyguards. The Garuda pillar at the Hoysaleswara temple in Halebidu stood in honor of Kuvara Lakshma, a minister and bodyguard of King Veera Ballala II. King Vishnuvardhana's coins had the legends "victor at Nolambavadi" (Nolambavadigonda), "victor at Talakad" (Talakadugonda), "chief of the Malepas" (Maleparolganda), "Brave of Malepa" (malapavira) in Hoysala style Kannada script. Their gold coin, called Honnu or Gadyana, weighed 62 grains of gold. Pana or Hana weighed a tenth of the Honnu, Haga a fourth of the Pana and Visa a fourth of Haga. Other coins existed, called Bele and Kani and people still use some of those terms such as Hana and Bele in the Kannada language today, meaning "money" and "cost" respectively. The defeat of the Jain Western Ganga Dynasty by the Cholas in early eleventh century and the rising numbers of followers of Vaishnava Hinduism and Virashaivism in the twelfth century mirrored a decreased interest in Jainism. Shravanabelagola and Kambadahalli represent two notable locations of Jain worship in the Hoysala territory. The decline of Buddhism in South India began in the eighth century with the spread of Adi Shankara's Advaita philosophy. Dambal and Balligavi constituted only places of Buddhist worship during the Hoysala time. Shantala Devi, queen of Vishnuvardhana professed Jainism yet commissioned the Hindu Kappe Chennigaraya temple in Belur, evidence that the royal family tolerated all religions. During the rule of the Hoysalas, three important religious developments took place in present day Karnataka inspired by three philosophers, Basavanna, Madhvacharya and Ramanujacharya. While scholars debate the origin of Virashaiva faith, they agree that the movement grew through its association with Basavanna in the twelfth century. Basavanna and other Virashaiva saints preached of a faith without a caste system. In his Vachanas he appealed to the masses in simple Kannada, writing "work is worship" (Kayakave Kailasa). Madhvacharya took a critical stance toward the teachings of Shankaracharya, arguing for world as real rather than illusion. His philosophy gained popularity enabling him to establish eight Mathas (monastery) in Udupi. Ramanujacharya, the head of the Vaishnava monastery in Srirangam, preached the way of devotion (bhakti marga) and wrote Sribhashya, a critique on the Advaita philosophy of Adi Shankara. Those religious developments had a profound impact on culture, literature, poetry and architecture in South India. Scholars wrote important works of literature and poetry based on the teachings of those philosophers during the coming centuries. The Saluva, Tuluva and Aravidu dynasties of Vijayanagar empire followed Vaishnavism, a Vaishnava temple with an image of Ramanujacharya stands in the Vitthalapura area of Vijayanagara. Scholars in later Mysore Kingdom wrote Vaishnavite works upholding the teachings of Ramanujacharya. King Vishnuvardhana built many temples after his conversion from Jainism to Vaishnavism. The later saints of Madhvacharya's order, Jayatirtha, Vyasatirtha, Sripadaraya, Vadirajatirtha and devotees (dasa) such as Vijaya Dasa, Gopaladasa and others from the Karnataka region spread his teachings far and wide. His teachings inspired later day philosophers like Vallabhacharya in Gujarat and Chaitanya in Bengal. Another wave of devotion (bhakti) in the seventeenth–eighteenth century found inspiration in his teachings. Hoysala society in many ways reflected the emerging religious, political and cultural developments of those times. During that period, the society became increasingly sophisticated. The status of women varied. Some royal women became involved in administrative matters as shown in contemporary records describing Queen Umadevi's administration of Halebidu in the absence of Veera Ballala II during his long military campaigns in northern territories. She also fought and defeated some antagonistic feudal rebels. Records describe the participation of women in the fine arts, such as Queen Shantala Devi's skill in dance and music, and the twelfth century Vachana poet and Virashaiva mystic Akka Mahadevi's famed devotion to the bhakti movement. Temple dancers(Devadasi), well educated and accomplished in the arts, commonly danced in the temples. Those qualifications gave them more freedom than other urban and rural women restricted to daily mundane tasks. Hoysala practiced a voluntary form of sati pervasively, while considering prostitution socially acceptable. As in most of India, the institute of the Indian caste system prevailed in Hoysala society. Trade on the west coast brought many foreigners to India including Arabs, Jews, Persians, Chinese and people from the Malay Peninsula. Migration of people within Southern India as a result of the expansion of the empire produced an influx of new cultures and skills. In South India, towns called Pattana or Pattanam and the marketplace, Nagara or Nagaram, the marketplace served as the nuclei of a city. Some towns such as Shravanabelagola developed from a religious settlement in the seventh century to an important trading center by the twelfth century with the arrival of rich traders, while towns like Belur attained the atmosphere of a regal city when King Vishnuvardhana built the Chennakesava Temple there. Large temples supported by royal patronage served religious, social, and judiciary purposes, elevating the king to the level of "God on earth." Temple building served a commercial as well as a religious function, open to all Hindu sects. Shaiva merchants of Halebidu financed the construction of the Hoysaleswara temple to compete with the Chennakesava temple built at Belur, elevating Halebidu to an important city as well. Hoysala temples, although secular encouraged pilgrims of all Hindu sects, the Kesava temple at Somanathapura being an exception with strictly Vaishnava sculptural depictions. Temples built by rich landlords in rural areas fulfilled fiscal, political, cultural and religious needs of the agrarian communities. Irrespective of patronage, large temples served as establishments that provided employment to hundreds of people of various guilds and professions sustaining local communities as Hindu temples began to take on the shape of wealthy Buddhist monasteries. Although Sanskrit literature remained popular during the Hoysala rule, royal patronage of local Kannada scholars increased. In the twelfth century, some scholars wrote works in the Champu style, but distinctive Kannada metres became more widely accepted. The Sangatya metre used in compositions, Shatpadi, Tripadi metres in verses (seven and three line) and Ragale (lyrical poems) became fashionable. Jain works continued to extol the virtues of Tirthankaras (Jain ascetics). The Hoysala court supported scholars such as Janna, Rudrabhatta, Harihara and his nephew Raghavanka, whose works endure as masterpieces in Kannada. In 1209, the Jain scholar Janna wrote Yashodharacharite, the story of a king who intends to perform a ritual sacrifice of two young boys to a local deity, Mariamma. Taking pity on the boys, the king releases them and gives up the practice of human sacrifice. In honor of that work, Janna received the title "Emperor among poets" (Kavichakravarthi) from King Veera Ballala II. Rudrabhatta, a Smartha Brahmin (believer of monistic philosophy), represents the earliest well known Brahminical writer. Chandramouli, a minister of King Veera Ballala II, became his patron. Based on the earlier work of Vishnu Purana, he wrote Jagannatha Vijaya in the Champu style relating the life of Lord Krishna leading up to his fight with the demon Banasura. Harihara, (also known as Harisvara) a Virashaiva writer and the patron of King Narasimha I, wrote the Girijakalyana in the old Jain Champu style describing the marriage of Lord Shiva and Parvati in ten sections. One of the earliest Virashaiva writers independent from the Vachana literary tradition. He came from a family of accountants (Karanikas) from Halebidu and spent many years in Hampi writing more than one hundred Ragales (poems in blank verse) in praise of Lord Virupaksha (a form of Lord Shiva). Raghavanka had been the first to introduce the Shatpadi metre into Kannada literature in his Harishchandra kavya, considered a classic even though it occasionally violates strict rules of Kannada grammar. In Sanskrit, the philosopher Madhvacharya wrote Rigbhshya on Brahmasutras (a logical explanation of Hindu scriptures, the Vedas) as well as many polemical works rebutting the doctrines of other schools of Vedas. He relied more on the Puranic literature than the Vedas for logical proof of his philosophy. Vidyatirtha's Rudraprshnabhashya represents another famous writing. Exquisite attention to detail and skilled craftmanship characterize Hoysala temple architecture. The tower over the temple shrine (vimana), delicately finished with intricate carvings, shows attention to the ornate and elaborately detailed rather than to a tower form and height. The stellate design of the base of the shrine with its rhythmic projections and recesses carries through the tower in an orderly succession of decorated tiers. Hoysala temple sculpture replicates that emphasis on delicacy and craftsmanship in its focus on depicting feminine beauty, grace and physique. The Hoysala artists achieved that with the use of Soapstone (Chloritic schist), a soft stone as basic building and sculptural material. The Chennakesava Temple at Belur (1117), the Hoysaleswara temple at Halebidu (1121), the Chennakesava Temple at Somanathapura (1279), the temples at Arasikere (1220), Amrithapura (1196), Belavadi (1200) and Nuggehalli (1246) stand as notable examples of Hoysala art. While the temples at Belur and Halebidu have earned fame for the beauty of their sculptures, the Hoysala art finds more complete expression in the smaller and lesser known temples. The smaller Hoysala temples, like the ones at Somanathapura, Javagal, and Nuggehalli, really convey the full meaning of Hoysala architecture, according to Foekema. The outer walls of all those temples contain an intricate array of stone sculptures and horizontal friezes (decorative mouldings) that depict the Hindu epics. Those depictions generally read clockwise in the traditional direction of circumambulation (pradakshina). The temple of Halebidu has been described as an outstanding example of Hindu architecture and an important milestone in Indian architecture. UNESCO has proposed the temples of Belur and Halebidu as world heritage sites. the Hoysala empire used the Kannada and Sanskrit languages extensively. Temples served as local schools where learned Brahmins taught in Sanskrit, while Jain and Buddhist monasteries educated novice monks. Ghatikas denoted schools of higher learning. The rising number of devotional movements widely used the local Kannada language to express the ecstatic experience of closeness to the deity (vachanas and devaranama), while literary works used the language written on palm leaves tied together. While in past centuries Jain works had dominated Kannada literature, Shaiva and early Brahminical works became popular during the Hoysala reign. Writings in Sanskrit included poetry, grammar, lexicon, manuals, rhetoric, commentaries on older works, prose fiction and drama. Engravers carved inscriptions on stone (Shilashasana) and copper plates (Tamarashasana) in Kannada, Sanskrit or bilingual. Authors generally wrote the sections of bilingual inscriptions stating the title, genealogy, origin myths of the king and benedictions in Sanskrit. Scribes used Kannada to state terms of the grants, including information on the land, its boundaries, the participation of local authorities, rights and obligations of the grantee, taxes and dues, and witnesses. That ensured the local people clearly understood the content without ambiguity. ↑ Historians feel that Sala was a mythical founder of the empire, Kamath, 2001, 123. ↑ Derrett, in Ravindran Chopra and P.N. Subrahmanian. History of South India (Ancient, Medieval and Modern) Part 1. (New Delhi: Chand Publications, 2003. ISBN 8121901537), 150. ↑ K. Chandramouli, "The City of Boiled Beans," . The Hindu Jul 25, 2002, accessdate2006-11-17. ↑ Scholars remain unclear which among Vishaya and Nadu had a bigger area, and whether the commander (Dandanayaka) supervised Nadu. - Barrett in Kamath, 2001, 130–131. ↑ Many coins with Kannada legends have been discovered from the rule of the Hoysalas - Kamath, 2001, 12, 125. Kamath, Suryanath U. A Concise History of Karnataka from pre-historic times to the present. Bangalore: Jupiter books, MCC, 2001. OCLC: 7796041. Nilakanta Sastri, K.A. A History of South India, From Prehistoric times to fall of Vijayanagar. New Delhi: Oxford Univ. Press, (1955). Reprinted 2002. ISBN 0195606868. Rice, B. L., Mysore Gazatteer Compiled for Government vol 1. since 1897. New Delhi: Asian Educational Services, 2001. ISBN 8120609778. Stien, Burton. Vijayanagara. Cambridge University Press, 1989. ISBN 0521266939. Thapar, Romila. The Penguin History of Early India, From Origin to 1300 C.E. New Delhi: Penguin, 2003. ISBN 0143029894. All links retrieved January 15, 2018. The City of Boiled Beans. The Hindu, Thursday, Jul 25, 2002. Belur proposal for World Heritage Status. The Hindu, Sunday July 25, 2004. Coin in memory of Basaveshwara The Hindu, Monday, Jun 26, 2006. Kalam calls for corruption-free society The Hindu, Sunday, Apr 27, 2003. Karnataka Haridasas Haridasa Home Page. This page was last modified on 15 January 2018, at 17:46.